My parents wanted our house to be where us kids would hang out when we were teenagers. We didn't have a pool, or a pool table, or the latest electronics, but what my brother and I did have, was a mom that made snacks. Good snacks. Nearly every weekend we would rent a cheesy horror flick like "Attack of the Killer Tomatoes", flop on comfy couches, and eat tons of yummy food. To this day, our friends know that if we hang out at my parents' house, we're going to get fed. One friend in particular loved a cake that my mom would make. He would request it and for good reason; it's awesome! 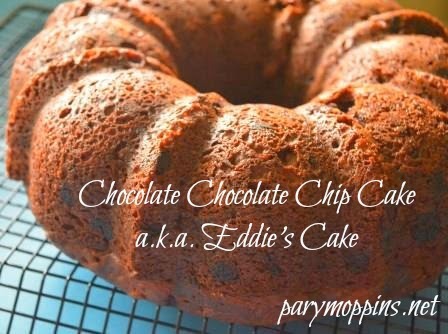 He liked it so much that we started calling it Eddie's Cake. This is one of my all-time favorite cakes too - both to make and to eat. It is of the highly popular "dump" variety of foods - you dump in all the ingredients, give it a whirl, and cook it. Done. I have never had this turn out badly. There's a first time for everything obviously but so far, so good. 1 (3.9 oz.) pkg. Chocolate Fudge Instant Pudding. Preheat oven to 350F. Mix all ingredients and cook in Bundt pan for 1 hour. Cool 20 minutes. Okay, that's where my Momma would stop because she is good at following directions. Me, not so much so I add a little something extra y'now, 'cause that's how I roll. The cake sounds delicious, but I am doing my best to avoid sugar right now. Maybe I should pin it for a special occasion? Enjoyed reading your blog. It is delicious Ms. Betty and if you try it on that special occasion, you'll be so glad you did! :) Thanks for stopping by! How about "Happy Friday! Let's make a cake." :) Sounds like a good excuse to me.